Dysfunction of the sacroiliac joint may cause low back and/or leg pain. The sacroiliac joint is the “chameleon” of the spine; SIJ dysfunction can mimic the pain caused by a number of other spinal structures (lumbar disc, nerve root, facet joint, or hip). The pain is typically felt on one side of the low back or buttocks, and can radiate down the leg. The pain usually remains above the knee, but at times pain can extend to the ankle or foot. The sacroiliac joint lies next to the spine and connects the bottom of the spine (sacrum) with the pelvis. The joint is supported by a very strong set of ligaments. Transmit all the forces of the upper body to the lower body. 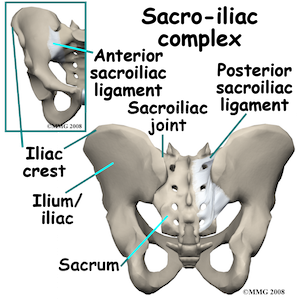 Accurately diagnosing sacroiliac joint dysfunction can be difficult. A diagnosis is usually suspected by the physical examination and then confirmed with an injection under fluoroscopic (live x-ray) guidance: A sacroiliac joint injection (block) is more difficult than it appears. It requires a highly skilled and experienced physician to be able to insert a needle into the correct portion of the sacroiliac joint. In this test, the spine physician uses local anesthetic, usually lidocaine (“numbing” medication). If the injection relieves your pain, it provides much stronger proof (than physical exam alone) that the sacroiliac joint is the source of your pain. The physician may block the complex series of small sensory nerve fibres that travel to the sacroiliac joint. Some physicians prefer to directly inject the dorsal ligaments themselves. Physical therapy and exercise: Beneficial in restoring pelvic balance by achieving improved flexibility and strength of the pelvic, abdominal, and lower extremity musculature. Aquatic therapy: Patients with severe pain may have an easier time tolerating the low-impact environment of the pool. Plus the constant resistance of water provides an excellent environment for activating key stabilization muscles of the pelvis. It may take months of intensive therapy to restore normal function to your pelvis. For more resistant cases for intractable pain, patients may benefit from a Sacroiliac Joint Neurotomy. Sacroiliac joint neurotomy is minimally invasive and takes approximately 45 minutes. It is performed as an outpatient procedure, does not involve general anesthesia, and may offer a lower risk of complications when compared to more invasive treatments. 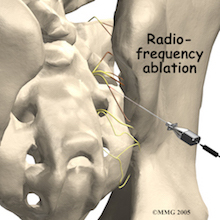 During the procedure, a radiofrequency probe is inserted into the region of the sacroiliac (SI) joint through an introducer needle. Radiofrequency energy is then passed through the probe, which heats the tissue (specifically, the sensory nerves) surrounding the probe. The sensory nerve fibers in the SI joint that may be responsible for pain are thus deactivated. Pain in the buttock that radiates down back of the leg is commonly called sciatica. Believe it or not, the most common cause for sciatica is not a result of injury to the sciatic nerve. Typically, sciatica results from irritation of the spinal nerves in or near the lumbar spine (usually from a disc herniation). Sometimes the nerve irritation/compression is not in the spine but further down the leg. 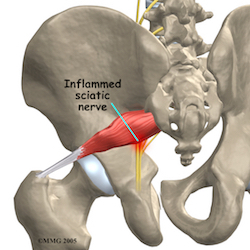 One possible cause of true sciatic nerve pain is piriformis syndrome. The piriformis muscle begins inside the pelvis. It runs from the sacrum, to the greater trochanter (bump of bone on the top side of your hip). The sciatic nerve runs under (and sometimes through) the piriformis muscle on its way out of the pelvis. The piriformis muscle can squeeze and irritate the sciatic nerve in this area, leading to the symptoms of sciatica. Magnetic resonance imaging (MRI) is used to look at the lumbar spine and pelvic structures in much more detail. Fluoroscopic (x-ray) guided injections. The most accurate way to tell if the piriformis muscle is the cause of pain is with a diagnostic injection into the muscle. Once the needle is placed in the muscle, an anesthetic can be injected into the muscle to paralyze the piriformis muscle. If the pain goes away after the injection, your physician can be reasonably sure that the pain you are feel is from piriformis syndrome. Piriformis muscle injections: Injections of local anesthetic under live x-ray guidance temporarily paralyzes the muscle and relieves the compression of the sciatic nerve. Often, the injection must be repeated 3 times over a 6 to 8 week period while the patient simultaneously participates in physical therapy. Physical therapy and exercise: Beneficial in restoring pelvic muscle balance by achieving improved flexibility and strength of the pelvic, abdominal, and lower extremity musculature. Typically, patients will begin physical therapy and achieve their best results following their first piriformis muscle injection. It may take months of intensive therapy to restore normal function to your pelvis. For only the most resistant cases, patients may benefit from surgery. Surgery may be considered but usually only as a last resort. The piriformis tendon may be cut where it attaches on the greater trochanter (the bump on the side of your hip). Another approach is to cut through the piriformis muscle to take pressure off the sciatic nerve.